Raise your hands if you’ve seen enough of the kitchen lately. Anyone? I am just about at that point – yes, even me! The holidays are always a blur of delicious food and lots of dirty dishes, and for those of you following the Whole Living 2012 Action Plan (I hope you enjoyed my detox recipes in week 1! ), you know that meal prep can be tiring. So if the time has come when you just feel like making a huge pot of something that can last a few days so you don’t have to think about what to make for dinner…again…here is a soup for you. This Root Vegetable Mulligatawny soup is substantial enough to fill you up—a hearty change from the limited-protein recipes from last week’s recipes. Mulligatawny is a curry-flavored Indian soup that literally means “pepper water”. There are endless variations, and no one right way to make it, but in the end you’ll surely have a thick, rich, golden-hued broth studded with tender vegetables and satisfying legumes. I chose to do a twist on a traditional Mulligatawny soup with the addition of root vegetables. So tasty! Root vegetables might not have the flashy allure of spring and summer produce, but they’re an incredibly flavorful bunch of edibles that deliver the nutrition and nourishment our bodies need during the winter. I like this kind of cooking: get all the work out of the way in one swoop, and then sit back and enjoy for days on end. Plus, this is one of those dishes that actually tastesbetter the day after, so it only makes sense to cook up more than you need. If you do not have all of the spices on hand, just use a couple tablespoons of your favorite curry powder. 1. Cover lentils with water to soak while you prepare the rest of the dish. 2. In a large stockpot, heat the oil and add all spices and minced ginger (not the garlic). Stir often so spices do not burn. When the mix smells fragrant, add onions and cook until softened (if the mix becomes too dry, add a little of the tomato liquid and stir well). Add garlic and cook a couple minutes more. 3. Add the chopped vegetables and stir well to coat with spices. Cook for 5 minutes. Add chickpeas, if using, and cook until heated through. Add canned tomatoes and coconut milk. 4. Drain and rinse lentils very well and add them to the pot, along with the vegetable broth. Bring to a boil, then cover and reduce heat to simmer. Cook for 20-30 minutes until the lentils are soft and the root vegetables tender. 5. Add tamarind (or lemon juice) to the soup. Season to taste. 6. Garnish soup with fresh cilantro and some quality olive oil. Serve hot. Tastes amazing the day after! Hello there, I discovered your web site by way of Google even as searching for a comparable matter, your website got here up, it appears great. I have bookmarked it in my google bookmarks. I not to mention my friends were actually reviewing the excellent tricks located on the website and at once I got an awful feeling I never expressed respect to the blog owner for those strategies. My boys are actually for that reason excited to see all of them and already have really been tapping into them. I appreciate you for really being so helpful and for making a choice on this sort of amazing things most people are really desperate to know about. My sincere apologies for not expressing gratitude to earlier. This dish is wonderful. My husband and I had a nice big bowl of your soup while watching the snow swirl around outside our kitchen window. Yum, yummity, yum yum!! My tum is so full of good soup! I often crave soups that are super cleansing and feel-good dishes, especially after traveling or during the holidays. This absolutely hits the spot, it’s delicious! I used sweet potato, celeriac, and carrots. Substituted Thai basil for curry leaves since I have still yet to find them in my small Swiss city. And I used tamarind paste but am thinking about drizzling pomegranate molasses over next time! I touch it I mess something up. Did you design the blog yourself? Could someone with little experience do it, and add updates without messing it up? We are an IT Solution providers and specially expert in all kind of web development. We will try to be the best outsourcing solution for you. I just found your blog via The Edible Perspective and I love it! Whenever people ask me health related questions now I can just direct them to your blog! I look forward to trying this. I love soup and I’ve been experimenting lately with indian flavors. p.s. great spread in whole living! Yes, the sweet potato is raw…and delicious! if you’re never tried raw sweet potato before, you’re in for a treat – it’s a revelation! I would love to do the cleanse, but I’m breastfeeding and am starving constantly;) but I do have a question about the sweet potato, celery, and apple salad. Is the potato supposed to be raw? Just curious…I’ve ever eaten raw potato before. I recently found your blog and I love it! I am looking forward to starting your detox diet within the next week. Hello Cobb – the reason you’re craving chocolate is because your body is lacking magnesium. Try a handful of pumpkin seeds, or a green juice. That should help! I too am following the cleanse after reading your last post – I’m on day 6(!) and have a question: would raw organic cacao nibs (in moderation) be ok for week 2? There’s no added sugar, other junk, and they’re technically a bean, right? I’m having serious chocolate cravings due to pms and am fantasizing about sprinkling some nibs on a banana… thoughts? My weakness is soup! I’m in fact fairly sure I could live off of soup alone. This looks absolutely delicious, and I love the Seinfeld reference. Thank you, Sarah! I’ll look for olive wood utensils! By the way I cooked this soup like an hour ago:) We’re going to have it for dinner! I am not following the detox program cause I in fact eat “detox” on my everyday basis:) I checked the menu and realized that! I will cook this soup/stew tomorrow! Just today I bought a package of red lentils to make some soul warming winter dish! Just one off-top question if I may… Sarah, where did you find those great wooden folks and spoons? I went through all shops, web sides and flee markets and never found them. Please!!!!! I´m thinking I should probably come up with a song for you since you and your creativity make my heart sing! Looks fabulous. I’m loving all the depth of flavor in this one. Will give it a try for sure. And I miss Seinfeld! Nothing gets me in the mood for soup more that the Soup Nazi episode. Legendary! And since I love extra hugs and have never tried mulligatawny soup before I am soo making this recipe. I love the reference to Seinfeld – what a classic episode! Pop culture is certainly full of delicious possible meals. I looooove mulligatawny soup, and not just because it makes me think of Seinfeld! This looks so good! I’m glad I found your blog-perfect timing for sure. the soup looks so gorgeous! 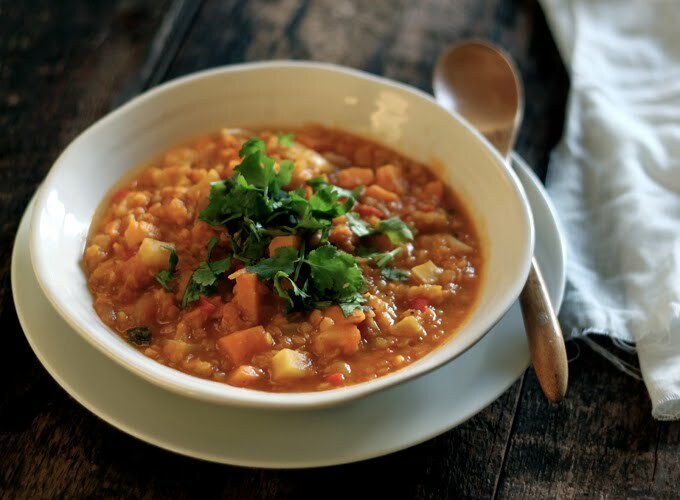 i love red lentils and the soup looks perfect with all the vegetables. i am also intrigued by the cleanse plan. i dont know why i havent found yr blog before! Just found your blog – it is lovely! Yum, the addition of coconut milk makes this dish sound heavenly. I like how you use coconut oil as well. I have been reading about the benefits of coconut oil for awhile now. Thanks for the inspiration for this curry/indian soup! Oh wow, that looks amazing right about now since it’s 10 degrees outside! I’ll be making this next week!